This long weekend, I was finally able to call my daughter’s birthday quilt DONE! Which is a long overdue relief since her birthday was in aahhhem– April!!! I think the reason I hesitated so much on this quilt is because after I finished quilting it, I just wasn’t feeling the love for it as much. Way back in January when I had it up on the design wall, I really was having fun with it. 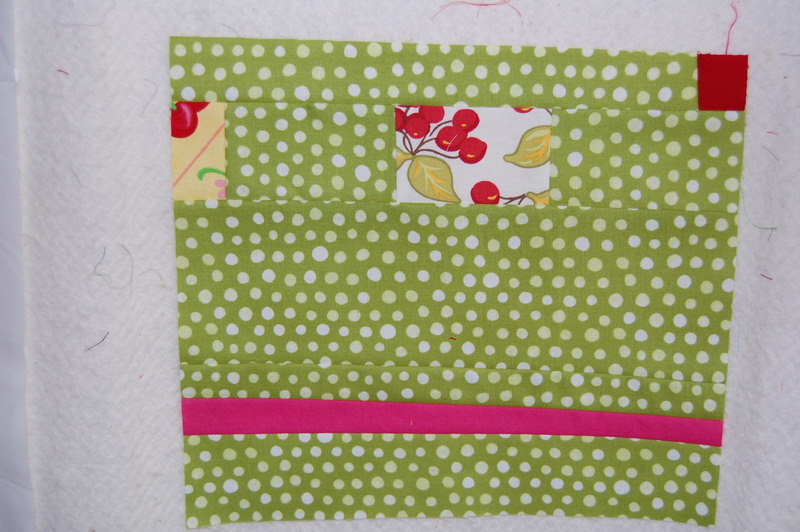 I had gathered all the cherry themed fabric I could find for about 6 months or so, per A’s request. She loves cherries and the color red. With her in mind, I started building, REALLY fun, random, wonky, playful (all of A’s best attributes) blocks. And put them together on the wall. So far, I was loving it! Would I give it as a gift to just anyone? NO. Is it my personal color scheme choice? NO, Do I think it’s the prettiest combination of fabric? NO. Will A love it? Most definitely!!! After all we’re talking about the girl who wears, polka dots with plaid, all the colors of the rainbow– at the same time, etc. She’s always been drawn to bright and playful!! 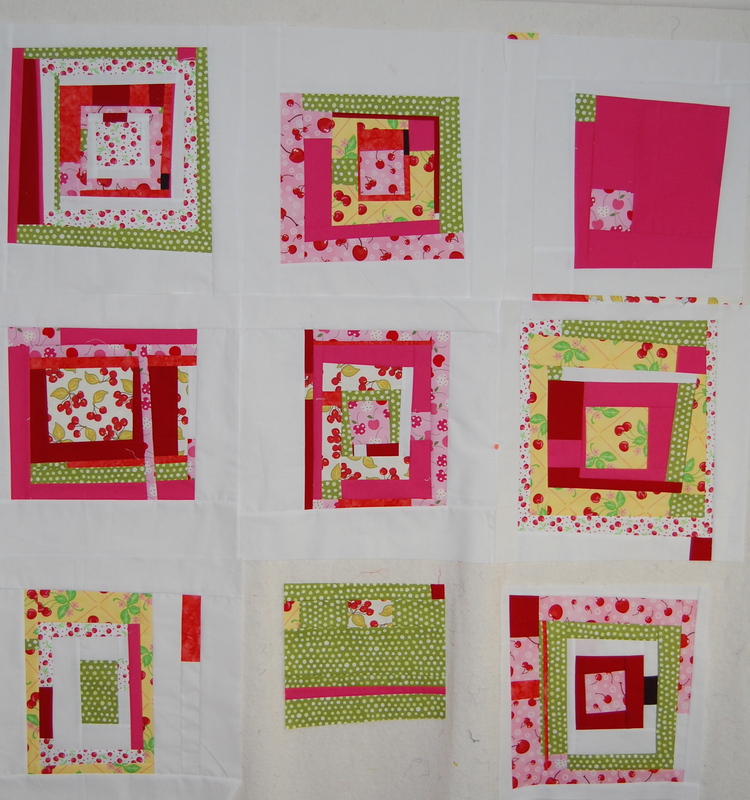 I think where I went wrong, was going against my intuition on quilting color. 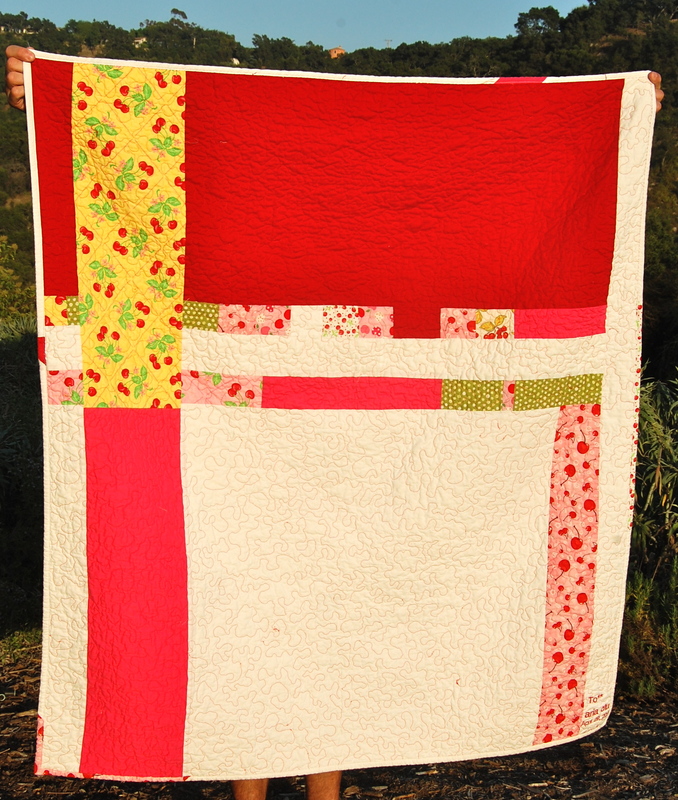 I asked my 4 year old what color she wanted, and since it was her quilt, when she said “red” I cringed internally, then decided to go with it. Against my better judgement, in my opinion. I would loved to have uses white or a nice very light pink or green or yellow, basically anything BUT red. Ha! Anyway, it was done and too late to change it so…..I got to the binding stage and then found myself finding any possible reason to put it off. Guilt finally took over, and of course my daughter’s continuous question “mamma, where is my quilt?”. So I decided it was time to get busy this weekend and finish the binding so I could put the whole project behind me. Here is the back by the way. Just a simple pieced back using up some leftovers. The lighting was a little weird on this one, but you get the idea. In the end I suppose if A likes it, that’s all that matters! I love your blog. It has a sincere ring. I can see how any young girl would adore this quilt, and as a matter of fact, this old gal thinks it’s pretty great too. 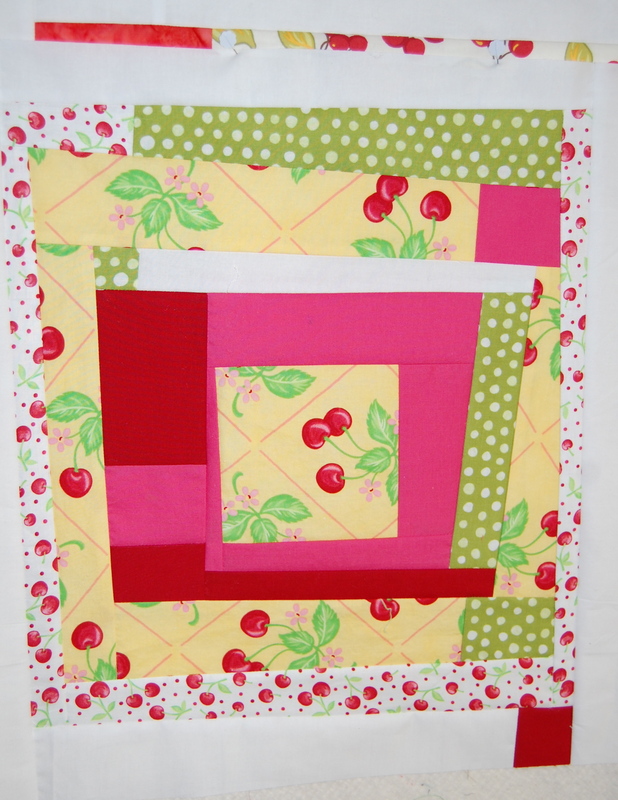 I would love to have seen a close-up of the red quilting color. 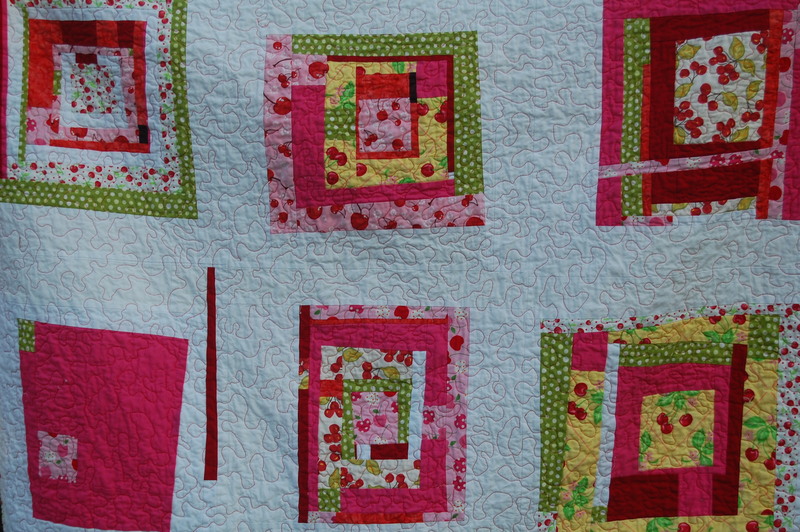 Actually, I bet your daughter’s intuition makes this quilt more striking and unique. Wonderful! Thank you! Yes, her intuition is definitely what mattered most here…. I think it’s absolutely gorgeous! I love all the little “bits” scattered everywhere – so pretty! I personally love it! Great job! thank you, it’s really starting to grow on me– especially seeing how much she loves it. You’ve been busy! These are gorgeous, and lucky girls will be the recipients! thanks karen, for taking the time to look….. 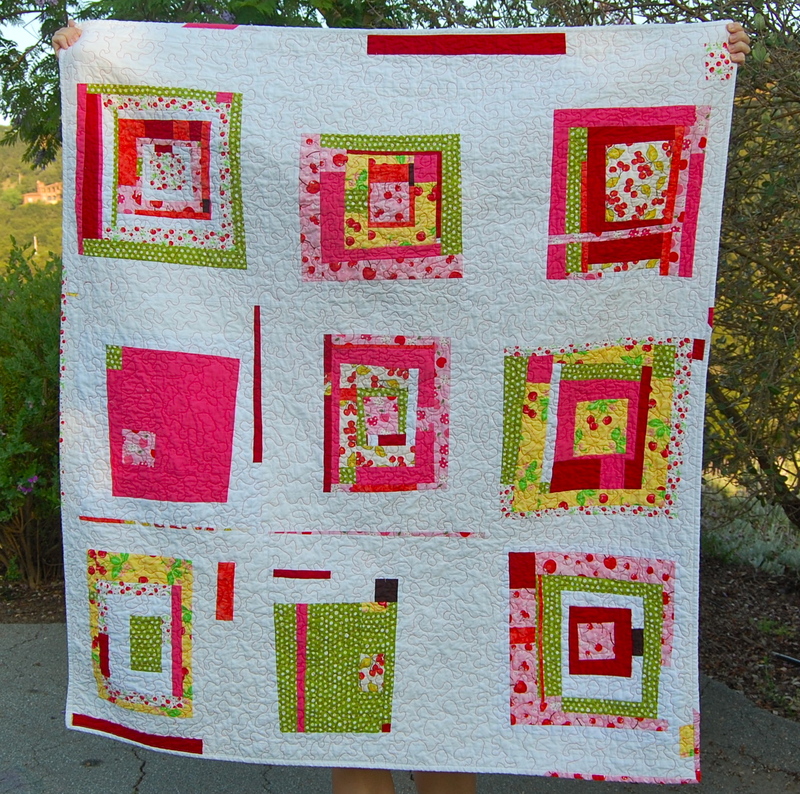 I love it, front, back and quilting! Your a good mama!! just saw this on flickr…I LOVE it!!!! Love the colors, the randomness, front and back! Your daughter will treasure it all the more because she got to put her 2 cents into it!